Once upon a time, The Worm that Turned got an email and then a phone call, from a a nice lady called Caela, asking if they would like to set up a new shop on a pig farm near Ipswich. 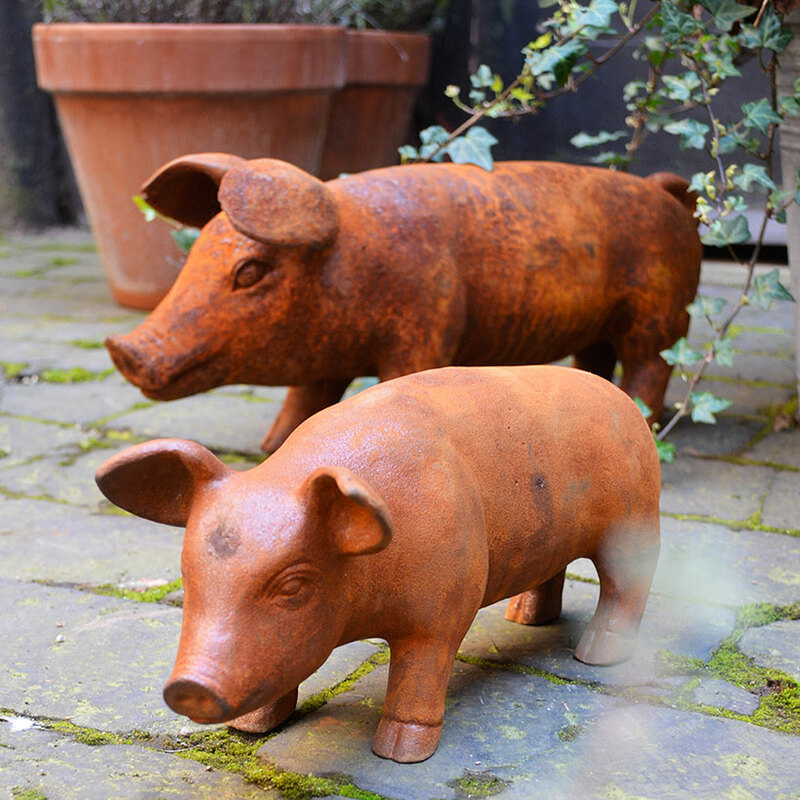 The owners of the company, having plenty of time on their hands because they only ran one other shop and a website, thought this would be a great idea since Ipswich is only a 3 hour drive from Nottingham, and a pig farm was the ideal place to present their beautiful wares. "How long have we got to build this new shop in the former chicken shed?" they asked. "Two weeks, two whole weeks" came the reply. "Fantastic" thought The Worm that Turned, that would be ample time to construct a brand new display system, sort out the business processes, choose the products, order additional stock, and negotiate the contract between us. The owners made a personal visit to the farm and met with the farmers, and some of the other people who worked with them. They seemed like the sort of people with whom business could be done. And so it came to pass that the owners dropped everything they were doing at the time and worked like pig farmers for a fortnight to bring the shop to the pig farm. Now at this point dear reader, you may be forgiven for thinking that the good people of The Worm that Turned had one or two screws loose or shall we say, ‘The Worm’ had turned in a rather unusual direction. However, The Worm that Turned are not quite as daft as they are cabbage looking, and they had listened carefully to what the lady had told them. The lady was very nice and happened to mention that the pig farm had many visitors every year, and that they were just the people who would be looking for the kind of products sold by the company. She also let it slip that she owned the pig farm with her boyfriend, Jimmy, who had been the subject of a televisual project that had brought the farm to the attention of the good people of the United Kingdom at its inception, which in turn, had led to a further increase in visitors. Being imaginative, ambitious people (who, let it be said, have hearts firmly in the right place) a further extension of the farm was being planned (subject to planning permission) and additionally two further televisual programmes were being planned featuring Jimmy the Pig Farmer and thus even more people would be visiting the farm to experience a day out and perhaps get a glimpse of the young hunky pig farmer (I’d forgot to mention that bit before, but it seemed irrelevant). Jimmy had been to school with a young chef name Jamie,, who had also been the subject of a considerable amount of televisual time and thus, what could go wrong, thought The Worm that Turned. After all, nothing ventured is nothing gained. At this point it is perhaps necessary to bring in the hero of our story; Percy. Amongst many of its ranges, The Worm that Turned offers customers a carefully selected range of decorative garden items whose purpose is mainly adornment. However, the owners examined the selection in this part of their range and decided that it could be enhanced for the new shop. Furthermore, given the background in which the shop would be operating, a good idea for this would be a pig. Thus, the search began for such an item. Now, the owners of the Worm that Turned, Stuart and Heather, take great pride in their ranges and, in particular, endeavour to ensure that items that are merely decorative are not too cutesy, believing that if they are possessing such qualities, then it is easy to make the jump into the case for selling the dreaded gnome. The gnome is a symbol, in the eyes of Stuart and Heather, of all that can go wrong in the garden when people get carried away and, thus, they were particularly keen to avoid such a fate. Thus, when Percy came into their lives they knew he was just right. Nicely sized, not too cute, not too ugly and decidedly; a pig. Thus Percy was introduced into both their Nottingham Shop, the website and the newly opened garden shop at Jimmy’s Farm. The picture used on the website is of Percy on location at the farm with the pig pens in the background. Percy was an immediate hit and, despite a few skirmishes with being out of stock and, for one brief period, being shrunk in size, he has has been a firm favourite ever since. Sadly ‘The Worm’ pig farm shop is no more. The monsoon rains that arrived in the UK just days after it’s opening in 2007 (officially ‘a freak event unrelated to global climate change’) coupled with Avian flu, Swine fever, and a Foot and Mouth disease outbreak, made for an extremely poor summer at the farm (understatement,) despite Jimmy’s undoubted celebrity. 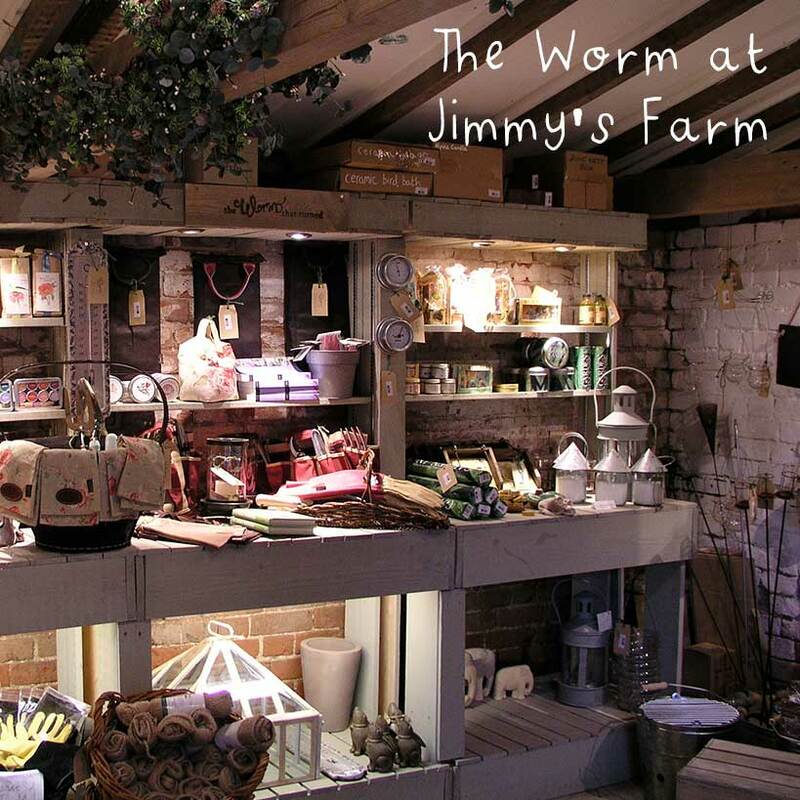 The BBC2 programme ‘Crisis at Jimmy’s Farm’ showed that the farm also had a strong Christmas attendance and thus potentially good traffic flow of Christmas shoppers for The Worm that Turned’s fine gift offering. Unfortunately, by the time the shoppers reached the farm to pick up their Xmas orders, many had already done their shopping and, whilst the farmers market held on the first Saturday of every month was good, the type of visitor who used the farm was predominantly there for the day out, often with children and thus did not necessarily want to buy many products other than the obligatory pack of very fine sausages. 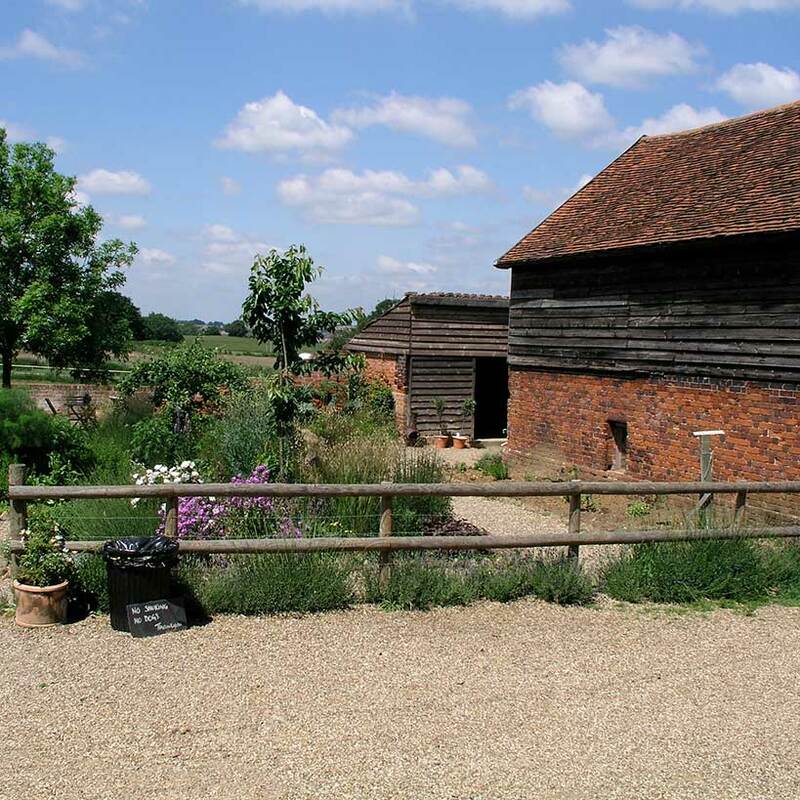 After making a revised offer on the terms for staying at the farm, The Worm that Turned reluctantly decided to leave the farm licking its considerable financial and emotional wounds, but having learnt much from the experience. Stuart does miss the sausages though (and Caela), but caught up with ‘Dolly’ (one of the farm’s helpers) at a food fair recently to stock up, and catch up with the gossip. 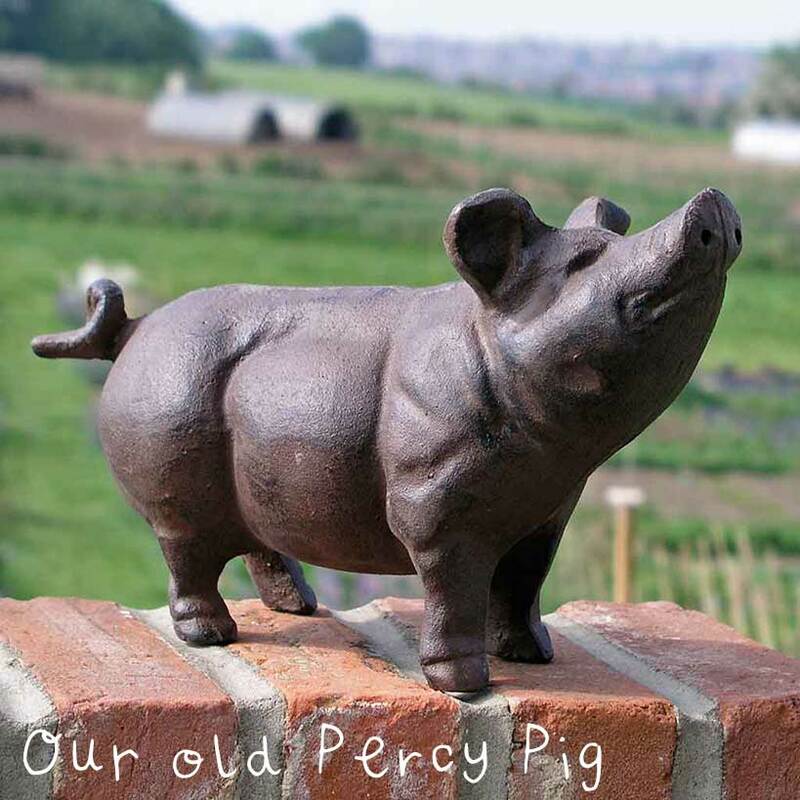 The physical legacy of the time there is a set of merchandise units which are now used in the Nottingham Shop and when venturing out to ‘Open Gardens’ plus, of course, the much loved Percy, a proud and noble pig who will hopefully live a long and happy life in your garden. Postscript: Percy is sadly no more either. However we do have a larger and some might say chunkier pig here.